One of the most exciting and interesting aspects of iOS 5 is no doubt the addition of a new way of handling notifications, called Notification Center. Bringing a home for all our new notifications that appear courtesy of the various apps we’ve all become so reliant on, Notification Center borrows heavily from the way Android has been handling such things for a couple of years. One thing that Android’s implementation doesn’t have, but Apple has given to the new Notification Center, is the addition of new widgets. The idea behind widgets is simple – offer users and apps a way to display useful information right in the pull-down notification area iOS 5 now sports. There’s one problem though, and that’s Apple’s reluctance to open their widget system to third-party developers. As is so often the case with these things though, that’s where the jailbreak community kicks in. QuickMemo is the latest jailbreak tweak to add a new widget to Notification Center, and as the name might suggest, it offers a handy way to take notes or memos – quickly. While not exactly full-featured, QuickMemo presents users with scratchpad in which to enter text, straight from Notification Center. No more swiping through pages in order to open a whole app just to write down the takeaway order. With Siri not yet allowing people to take notes, this is also an interesting way to get around that issue. Open Notification Center, bring up the iOS keyboard and stab at the dictation button. It’s not ideal, but given the fact the only other way to dictate notes is to actually open an app, this is better than nothing. 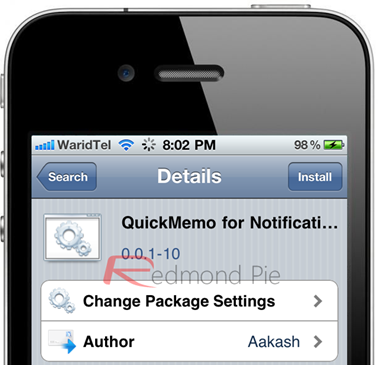 In order to use QuickMemo, you’ll obviously need to be running a Notification Center-enabled version of iOS, which at the moment basically means iOS 5. You’ll also need to be jailbroken too, of course. As mentioned above, you need to have iOS 5 running on your device for this amazing and handy tweak to work. You can follow our step by step guide posted here to jailbreak your iPhone, iPad or iPod touch on iOS 4.3.5 using Redsn0w (or PwnageTool). For jailbreaking iOS 5 tethered using Redsn0w (or Sn0wbreeze).